Anyone concerned about the quality of their healthcare ought to be aware of a potentially serious red flag that’s calling into question at least one doctor’s credentials: This brain surgeon has the results of an internet IQ test hanging where his med school diploma should be. This definitely feels a little off, and it’s pretty troubling coming from someone who does brain surgery. While most brain surgeons would have a framed diploma from an accredited medical school hanging prominently in their office, Dr. Emmet Moss instead has used a thumbtack to hang a printed-out screenshot of his results from GeniusTests.com’s online IQ test, on which Moss received a score of 112 based on 50 multiple-choice questions. Ideally, you’d want to see a medical degree or at the very least a PhD in a brain surgery–adjacent field like neuroscience before letting someone operate on your brain. 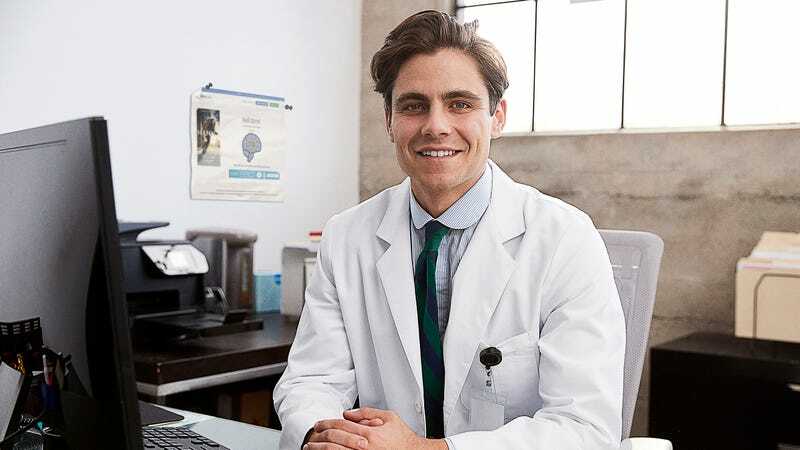 To find that the only institution vouching for this brain surgeon’s competency in any way is a banner ad–heavy website that claims in its fine print to be for entertainment purposes only is undeniably a bit suspicious. This isn’t immediately disqualifying, but the fact that he didn’t crop out the URL or even several other open browser tabs from the screenshot of his test results just doesn’t offer the reassurance you’d typically want from a doctor, let alone a brain surgeon. In addition to his score, the bottom of the printed-out screenshot also features an “Intelligence Fact of the Day” claiming that wine drinkers have been found to have higher IQs on average than beer drinkers, which Moss has worryingly circled in red marker with a scribbled note saying “Check!” It’s concerning enough that he seems to consider his 70th-percentile test score an acceptable substitute for displaying a Doctor of Medicine degree, though confidently citing spuriously sourced factoids like this just makes it all the more glaring that there’s no official academic certification to be found anywhere in his office at all. There’s definitely something fishy about this brain surgeon’s conspicuous lack of a real medical school diploma in his office. While his online IQ test score isn’t bad by any means, it’s probably worth hanging back and waiting for more information before anybody asks him to perform brain surgery on them.